Studying God’s creation is a part of loving God with all your mind. Biologists are confronted daily with evidence of God’s creative genius. And being a Christian biologist, in particular, requires excellence in understanding and applying the principles of biology combined with a distinctly biblical perspective on science. At BJU, we offer a ground-breaking biology curriculum taught by uniquely qualified faculty committed to the inerrancy of Scripture. Our program allows you to specialize and will involve you in significant real-world research opportunities. The challenging and rewarding experience of majoring in biology at BJU is unmatched in the world of Christian higher education. All of this works together to support the mission of Bob Jones University, namely to: Build faith by better understanding and appreciating God’s creation. Challenge potential through a stretching and rewarding curriculum. Follow Christ by serving others using science, and representing Christ in a field dominated by secularism. A unified, conceptual curriculum. Each of the core classes is conceptually based and committed to moving you to understanding, not simply fact memorization. From your first semester onward, you will be challenged to demonstrate your understanding as you apply what you learn to solve authentic problems, as well as to design your own experiments in the lab. A uniquely qualified faculty. The BJU biology faculty is truly unique. Each holds a PhD in a specialized area of biology, brings a unique set of research experiences to the classroom, and is committed to a biblical philosophy of science including a firm belief in a recent six-day creation. Significant hands-on opportunities. Whether it’s our sizable serpentarium, our cancer research lab or our state-of-the-art cadaver lab (rare for undergraduate programs), there’s no shortage of hands-on opportunities. Many of our everyday labs are modular in nature as well, focused on sharpening real-world skills used in the field. Two biology tracks enable you to customize your biology program. With both cell biology and zoo and wildlife biology tracks, you can specialize in order to prepare for a wide variety of graduate programs and careers. Regardless of the route you take, you will have a solid foundation at the molecular, cellular and organismal levels, and have a big-picture context of the interaction of organisms with each other and their environment. This is important because biology is increasingly integrative, as evidenced by the collaboration between our serpentarium and cancer research lab. Both tracks culminate in specialized capstone courses. The cell biology track culminates in a senior-level genetics course and a yearlong opportunity for independent research in our cancer research lab. The zoo and wildlife biology track climaxes with field and laboratory research in ecology and animal behavior aided by one of the largest collections of pythons and boas in any undergraduate institution. At BJU you’ll also benefit from the BJU Core, a unique combination of Bible and liberal arts courses. These courses will help mold you into a well-rounded Christian biologist who can communicate clearly and compassionately to people from many different walks of life. Each track is richly endowed with solid, required biology courses, but there are also many biology electives to choose from on the junior and senior level. To focus your preparation in cell biology you can choose electives in developmental biology, human physiology and anatomy, bacteriology and virology, histology, immunology, and cell and molecular biology. To specialize your zoo and wildlife biology track you can choose from courses in vertebrate zoology, invertebrate zoology, parasitology, plant physiology, and entomology. At Bob Jones University I encountered an environment where students were encouraged and challenged to develop in the mental, physical, spiritual and social aspects of life. This liberal arts educational approach contributes to the “complete” development of an individual. Within the science faculty I found men and women who were knowledgeable, honorable and sincere in their investment in my life. Considering the precept that “a student becomes like his teacher,” the intangible investments above and beyond the knowledge of a specific discipline continue to influence my life and the lives of those with whom I live and work. Now in the years since completing undergraduate studies (and subsequent advanced degrees), I trust these investments are producing returns with new investments in the lives of others through research projects, teaching and scientific collaborations. Senior Research Associate, Eli Lilly Co.
With the science knowledge, research skills and lab experience BJU provides, our graduates are prepared for countless opportunities. A biology degree can lead to hundreds of careers in the science and medical fields, including positions in medical labs, research institutes, zoos, national parks, corporate industries and forensics labs. While there isn’t one main career path our graduates take, many decide to further their education in a specific field by attending graduate school. View Gainful Employment data for this major. The BJU Biology Department has been a pioneer in developing innovative curriculum since the mid-1960s when we first created General Biology as the entry course to replace the then standard starting point of Zoology or Botany. We saw in the 1960s the need to develop a course that integrated all of biology into clearly articulated foundational ideas at the cellular level. We responded in 1986 with the creation of a senior-level course, Bio 506 Cell and Molecular Biology. As the new biology shattered old paradigms, it necessitated an expansion of the conceptual base down to the freshman and sophomore years. We responded by creating a required sophomore-level course, Essentials of Cell Biology, in 1999. General Biology I and II and Essentials of Cell Biology now constitute the core curriculum of the biology and premed/predent majors. The BJU biology faculty is truly unique. Each holds a PhD in a specialized area of biology, brings a unique set of research experiences to the classroom, and is committed to a biblical philosophy of science, including a firm belief in a recent six-day creation. Out from this flows a commitment to excellence in teaching, and the desire to train students to serve Christ wherever He places them. Each biology faculty member is committed to developing your God-given abilities in the classroom as well as in the laboratory and the field. Our faculty are passionate about teaching, and they hone their teaching skills and their courses in our Summer Institute in Teaching Science each summer. Our core curriculum is specifically designed to produce in students an understanding of biology at the foundational molecular level. We are not content with mere factual recall. Our students learn at a depth that allows them to apply their understanding to solving real-world science problems. Only after this deep understanding of the conceptual foundation of biology is achieved do students broaden their understanding to include the immense diversity of the biological world. Ultimately biology is something students do. It is a way of thinking that they exercise in asking scientific questions in an experimental context. Once again, our curriculum leads the way. During their very first semester in General Biology I, students learn how to design and conduct experiments. They do several small experimental studies and ultimately a semester project in which the findings are presented in written form as well as orally to the rest of the class, followed by a question and answer time. General Biology II continues this pattern at an even higher level and Essentials of Cell Biology lab consists almost entirely of experimental modules. 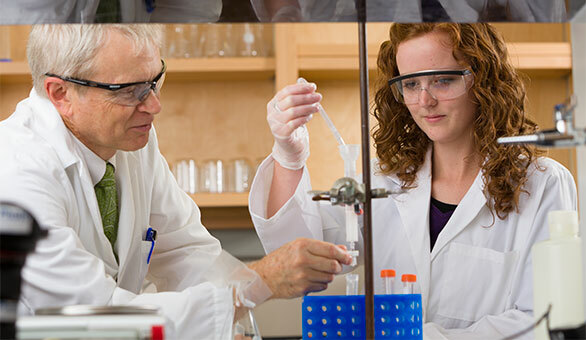 During their sophomore year, students take a course in Research Methods and Analysis, and nearly every biology course above that level includes a three-hour lab focused on experimentation. During both semesters of their senior year, biology majors in the Cell Biology track conduct independent research under the supervision of our full-time research director. This opportunity is also available to premed/predent majors. The research director orchestrates an expansive program of undergraduate research, which includes opportunities in cancer research in a new lab suite constructed expressly for this purpose. A summer-long research program in biology is also available. A summer Research Immersion for Undergraduates (RIU) program is offered for students, allowing them unparalleled opportunity to improve their skills as researchers while still undergraduates. As part of the research team, you’ll collaborate on experiments, testing the anticancer properties of a variety of substances on three types of cancer cells. In addition, you’ll get experience in writing and applying for research grants. BJU’s serpentarium is home to more than 150 reptiles. Students work with our resident herpetologist to get hands-on experience in research with these animals and make contributions to the scientific community. BJU’s advanced cadaver lab—taught by an experienced medical doctor—sets its biology program apart from many undergraduate programs. 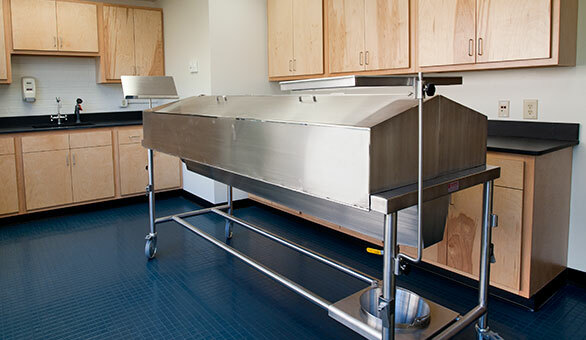 The cadaver lab provides an extensive, three-dimensional view of the human body and equips you with first-hand knowledge that prepares you for your field. Our students come to grips with anatomy and physiology in a Christian context so they can grow in their faith in and appreciation of the Creator, and prepare for the stringent academic expectations of biology and graduate schools. The cell biology track focuses on developing a deeper knowledge of cellular and molecular biology. This is the natural track for pursuing a research career. The zoo and wildlife biology track emphasizes selected organisms in their natural habitats. So if you’re thinking about a career in veterinary medicine, this is the track for you. Critically evaluate the limitations of science, materialistic and naturalistic philosophies, and demonstrate the superiority of the biblical worldview in explaining origins. Interpret and critique experimental data and experimental designs, formulate testable hypotheses and competently investigate hypotheses in the laboratory or in the field as appropriate. Compare and contrast the interrelationship between basic life processes with special emphasis on the role of information and energy transduction. Apply the relationship that exists between structure and function at multiple levels of biological organization and correctly predict the consequences of change or failure. Solve inheritance problems that demonstrate an understanding of fundamental transmission genetics. Articulate and develop a clear and original research question, and formulate a hypothesis concerning a problem in biomechanics. Identify and demonstrate appropriate research methodologies in the field of biomechanics, and know when to use them. Articulate and develop a clear and original research question, and formulate a hypothesis concerning a problem in the biomedical research field. Identify and demonstrate appropriate research methodologies in the biomedical research field, and know when to use them. Analyze how cells function internally and in social contexts, including the development and maintenance of tissues and organ systems. Apply the central dogma of molecular biology as a limited explanatory model for information storage and regulation of gene expression, and evaluate the role of epigenetic inheritance. Articulate and develop a clear and original research question, and formulate a hypothesis concerning a problem in the Environmental Technologies & Resources field. Identify and demonstrate appropriate research methodologies in the in Environmental Technologies & Resources field, and know when to use them. Make predictions about the behavior of selected animals in both natural and controlled environments. Evaluate theories concerning population, community, and ecosystem complexity.